The third episode in the second series of The Borgias witnesses the exit of King Charles VIII of France from Naples, and Cesare's first steps towards being head of the Papal Army. Some breathtaking though anachronous art historical references were made, particularly noticeable to fans of Raphael. Giuliano della Rovere makes plans that promise the show will soon return to Florence, and the Sforza arrive to join Charles in a confrontation that never was. The opening scene was particularly powerful, with Cesare nobly attempting to protect Lucrezia from the inevitable discovery of Paolo's sad fate. Paolo is sorrowfully mourned by Lucrezia, though she quickly gets a sense of Juan's involvement via the fake suicide letter beside Paolo. This explains Paolo's final scene with Lucrezia in episode two - where the audience was clearly reminded about his illiteracy. The following scenes showing Cesare and Alexander's confrontation of Juan were quite gripping. It was interesting to note how strongly Cesare and Alexander were protective of Lucrezia and her son - Alexander's lunging across the table at the arrogantly smirking Juan was a fantastic depiction of this. This episode is (at least) the second time the child's name has been affirmed as Giovanni - the name was also mentioned in whispers during the ill-fated last meeting of Paolo and Lucrezia. It seems writers are bringing the birth of Giovanni Borgia forward in time, noted to have been born in 1498. Referred to in documentary sources as the Infans Romanus - the child of Rome - the paternity of this child is a continuing source of debate. Some believe Giovanni was a child of Cesare or Alexander, others to Lucrezia. There are descriptions of Lucrezia referring to Giovanni as her half brother - though this did not prevent some from assuming the child was hers. Prior to this, the Italian city states - growing increasingly resentful of Charles's presence in Italy - formed the Holy League on 31 March 1495. This alliance is not described in the episode, though will undoubtedly be mentioned later. Another unusual aspect of this episode was Alexander's decision to place Bramante's apprentice Vittoria in charge of fortifying Rome via the forging of cannon. Artists were sometimes directly involved in battles - as described in the autobiography of Benvenuto Cellini. Michelangelo and Leonardo both contributed designs for fortifications at stages in their career, though it can be argued neither achieved any degree of effectiveness beyond elaborate drawings. In any event - it is increasingly unlikely that an apprentice would be placed in charge of such a project. Lucrezia spends half of the episode mourning for Paolo but eventually decides to make an attempt on Juan's life by sabotaging a chandelier to fall on him. This instead claimed the life of Juan's female companion, but affirmed that Juan's wayward behaviour was no longer tolerated by his own family. 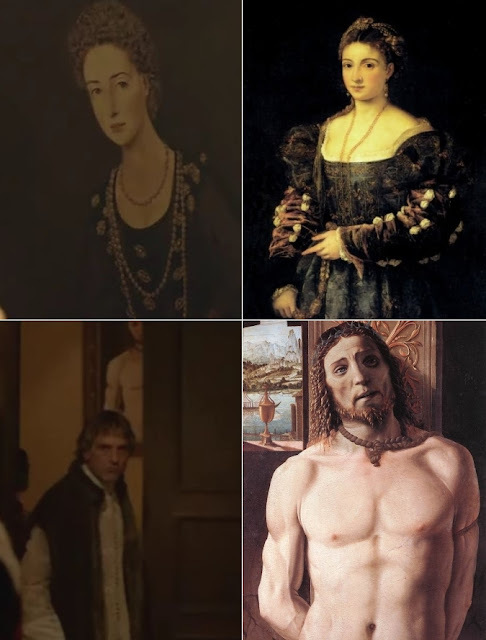 By the end of the episode Juan had selected a Spanish wife from the growing list of portraits in his bedroom and set off for Spain, as he had actually done in 1493, even before Charles had arrived in Italy. With events of the episode firmly establishing 1495 as the year, fans of artist Raphael Santi would be aware that he would have been twelve years old at this time. The only documents we have related to Raphael in this year are related to his uncle's arrangement of the affairs of Giovanni Santi's (Raphael's father) estate (Shearman). His activity as an artist or apprentice during this time are the subject of great speculation among scholars, but with no firm evidence beyond these legal documents. Despite this, it was still a great thrill to recognise two portraits attributed to Raphael in Juan's bedroom - the portrait of Elisabetta Gonzaga and the unknown woman known as La Muta, which has been previously described at 3PP - and among my own favourites of his Florentine style portraits. It should be mentioned that both are the subject of some disagreement among scholars with regards to their authorship - with the most recent Raphael catalogue by Meyer zur Capellen firmly rejecting the portrait of Elisabetta as by Raphael's hand. Kudos to the set decorators for putting these in - despite the anachronism, it is always fun to spot a Raphael on TV - especially one less well known such as the sublime La Muta. Other little treats can also be spotted by discerning eyes - from even further into the future is a portrait somewhat resembling Titian's La Bella, and a quick glimpse of the painting controversially attributed to Bramante, Christ at the Column. Neither of the paintings in the program are an exact match for the extant images - as the below comparisons will show. The Titianesque piece seems to have been painted for the show, and the piece resembling the Bramante does not have the distinctive (some say Leonardesque) background. If anyone can offer a clarification on these, please leave a note in the comments. Giuliano della Rovere - still travelling with his monkey poison tester - has fallen in with the Dominican monks and plots the death of Alexander. In reality, della Rovere is actually noted to have accompanoed Charles to Rome in June 1495. The most intriguing snippet of information supplied in these scenes is how Giuliano sees an ally in Fra Girolamo Savonarola. The prospect of the show revisiting Florence under Savonarola's power is quite exciting - and we can only hope there may be some small mention of Savonarola's tirade against indecent images - seeing how Giuliano della Rovere would hypothetically react to this is something the writers may show us, which the historical record unfortunately can not. The Holy League - a unique teaming of Italian City States against Charles seems to be on the show's agenda, as is della Rovere's return to Florence and Savonarola - which may hopefully give us some more glimpses at the great Florentine art of the period. Meyer zur Capellen. (Trans. Polter, S). Raphael - The Paintings. Vol 1. Arcos-Verlag. 2001. p. 298, 314. Shearman, JK. Raphael in Early Modern Sources. Yale University Press. Vol 1. Entries 1,2 for 1495. "and a quick glimpse of the painting controversially attributed to Bramante, Christ at the Column"
Now we are talking! What are the odds of this painting popping up in this show. 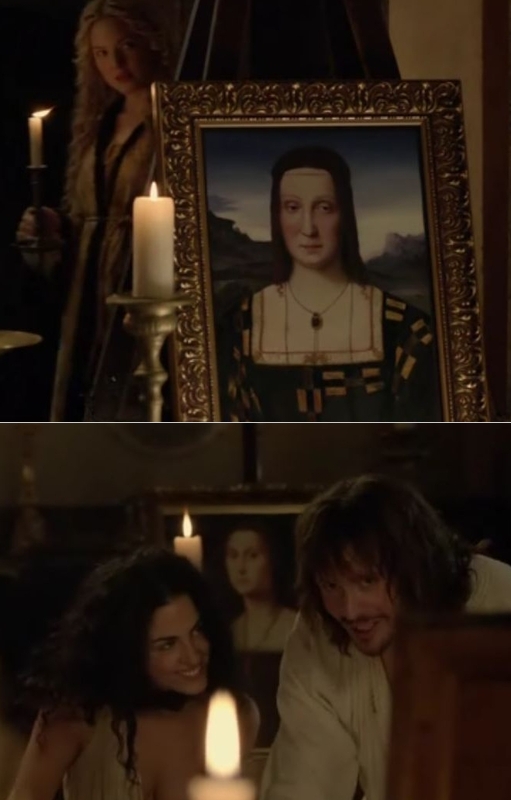 So I am wondering how this painting would have ended up in the show in this part of Italy at that time? Is there some reference for it being in the posession of these individuals at this time or is this some more TV story telling liberties? Hello Jeff! I had a feeling you would ask about this. It's *such* a small and partial glimpse only the quickest would have noticed it. The art depicted in the Borgias should be viewed in the manner of set dressing - to evoke the feel of a period. When I watched "I, Claudius" or HBOs "Rome" I was oblivious to whether a featured bust or sculpture in the background was known to exist at the time etc. Hence, unless one happens to know the dates of these works, I don't see it as a big deal. It's a drama, not a documentary! I must admit I think its fun trying to tease these details out. Added comparison images and note for the paintings that resemble works by Titian and Bramante, noting key differences. Searching for truth of plaster cannons, your posting portraits delightful.